I’m glad to be back in blog land after a few weeks away on holiday – more on this later! The cowl is designed to be oversized and chunky but you can easily adapt the pattern to suit your preferred style and yarn. I really liked my yarn choice because it’s made from a chainette construction and super soft. The cowl can be worn draped or folded in half so it stands up from the neck. The cowl is made in the round by first crocheting a horizontally striped base and then surface crocheting vertical stripes over the top. The vertical stripes are worked in surface crochet through ch1 spaces made in the horizontally-crocheted base. I used 4 colours – a main colour and 3 accents (blue, cream and chartreuse). I decided to work my vertical surface crochet lines in 4 stripes and then leave 4 chain spaces for the horizontal stripes to show through, which meant I needed 8 chain spaces for each pattern repeat. For 5 pattern repeats, I needed 40 chain spaces. The chain spaces are every other stitch (i.e. ch1, sc, repeat) so that means I needed a foundation of 80 chains. If you are modifying the pattern then please make sure that your foundation chain is the right length to fit over your head before you start! Begin with the main colour. Chain 80 and join with a sl-st to work in the round, making sure it isn’t twisted. 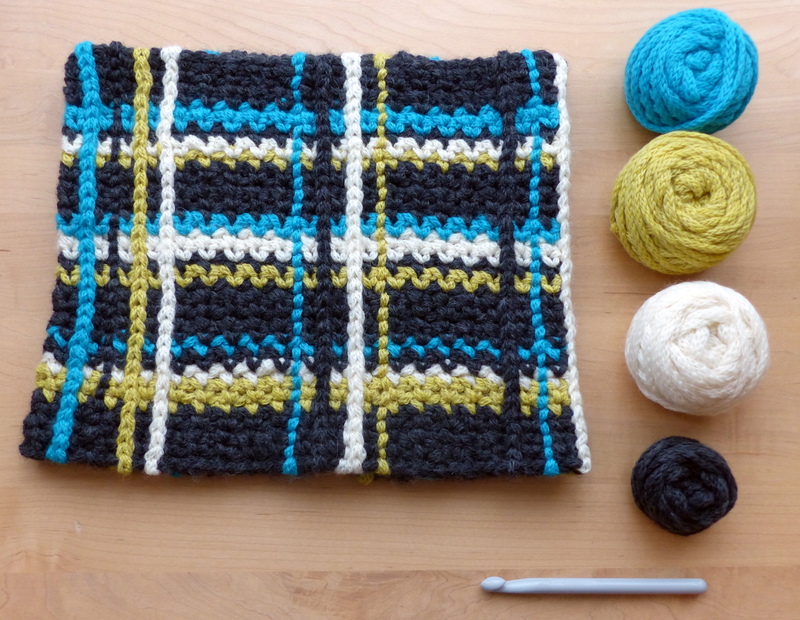 As you can see, I deliberately varied my stripes for visual interest but you can use whatever pattern you like! Just keep making rounds until your cowl is the size you want. Fasten off and weave in ends before starting the vertical stripes. Crocheting over the weaved in ends will secure them even more. Flip the work inside out so that you are looking at the “ridge” side. Keep the hook in the loop, and hold the working yarn behind the work. Surface crochet up the same chain spaces just worked into directly to one side of the ridge, so that there are 3 loops showing over each ch-sp. The back will look the same as the front. 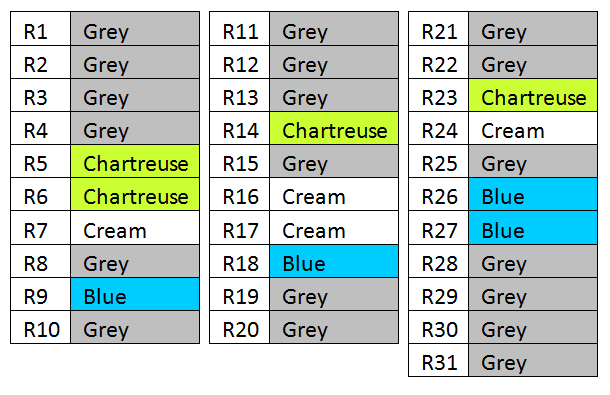 Fasten off at the top of the work and move on to the adjacent ch-sp using your preferred colour. Work 4 adjacent stripes, varying either single stripes, double stripes, or single stripes on the reverse. 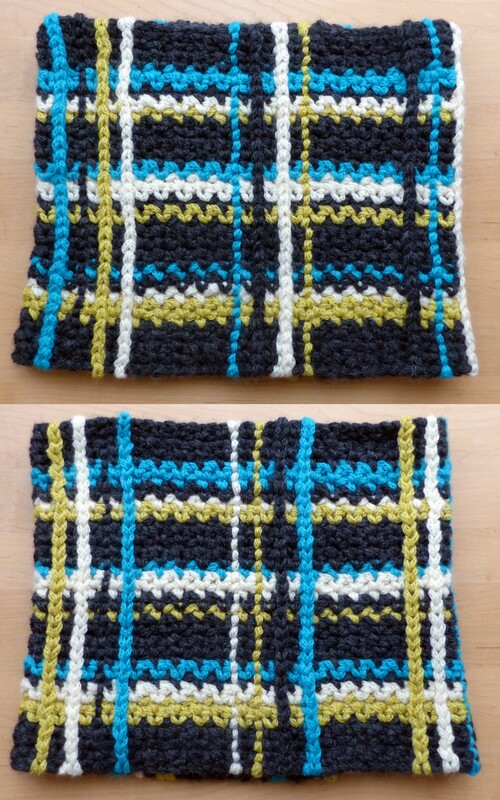 You will end up with a double sided cowl with a reversible pattern which is different on one side to the other. Skip 4 adjacent ch-spaces and repeat the process to make the next 4 stripes. Continue until all your vertical stripes are made.